Not many cities can boast of their own deer park. Harbor Springs can. Located in the city government complex off Zoll Street is this wonderful family spot. This fenced area is the home to several deer who are used to people coming up the fence to talk to them. So visit them! The very large, fenced in area has trees, shade, grass, and a feeding station. There is space for the deer to run and romp. Pull into the parking lot nearby and watch the deer lift their heads to see what you are up to. The Harbor Springs Deer Park is maintained by the city. The State Department of Natural Resources inspects the facility. The deer are tagged and they are protected by a 10 foot fence. 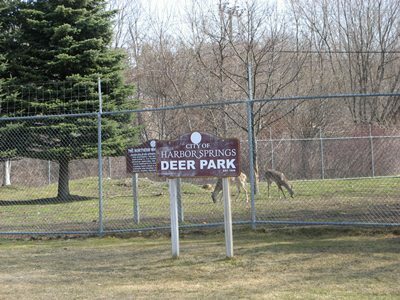 The Harbor Springs Deer Park is a great spot for families. Seeing the deer up close and watching them in their comfortable habitat is a family treat and a true Northern Michigan experience. To visit the Deer Park, drive into Harbor Springs on M-119 and make a left at the first street at the bottom of the Main Street hill, Zoll Street. Turn left into the second drive way and you'll see the Deer Park straight ahead adjacent to Jean Jardine Park.